Edgar Allan Poe's Snifter of Terror Archives - Horror News Network - The Horror News You Need! 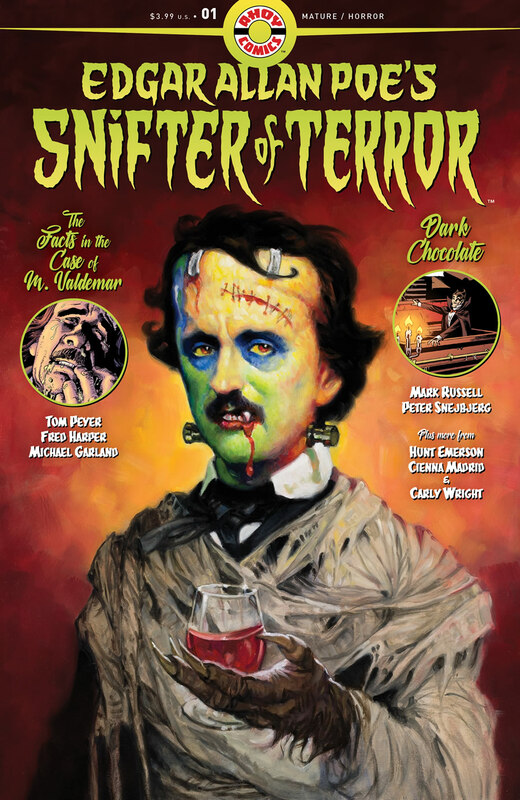 This Halloween Ahoy Comics will be unleashing Edgar Allan Poe’s Snifter of Terror, a horror anthology in the format of a magazine. A pretty bold move for the publisher in the digital age. The magazine presents itself as an anthology in the same vein as Tales from the Crypt. Your guide though the short macabre tales is none other than the godfather of goth himself, Edgar Allan Poe. The horror anthology has long been a favorite of comic readers, dating back to the origin of horror comics with William Gaines’ seminal EC Comics titles Tales from the Crypt and The Vault of Horror. We still get the occasional horror anthology comic, but they are much too infrequent for fans of serialized horror, so the news that comic veteran Tom Peyer is launching a new horror title along with his other anthologies from AHOY Comics was met with much excitement.